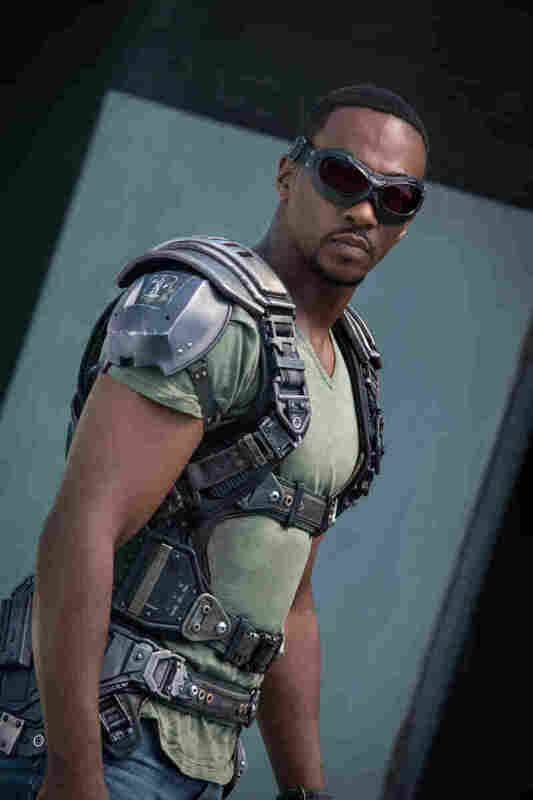 Anthony Mackie Soars As Captain America's Falcon Anthony Mackie plays Falcon in the new film Captain America: The Winter Soldier. He talks about the cultural significance of the Falcon, and how it's "monumental" for his eclectic career. Anthony Mackie as Falcon and Chris Evans as Captain America. Movie lovers probably already know Anthony Mackie from supporting but meaty roles in the Oscar-winning films 8 Mile, Million Dollar Baby and The Hurt Locker. But now he heads to the Marvel Universe in the new action film Captain America: The Winter Soldier. Mackie plays the Falcon, also known as Sam Wilson, a former military paratrooper skilled in air combat. He teams up with Captain America to face the legendary assassin known as the Winter Soldier. The Falcon was also a standout character on his own. He was the first African-American superhero in mainstream comics, the first super hero of color to get his own action figure, and a co-headliner with Captain America (the comic series was once renamed Captain America and the Falcon in the 70s). 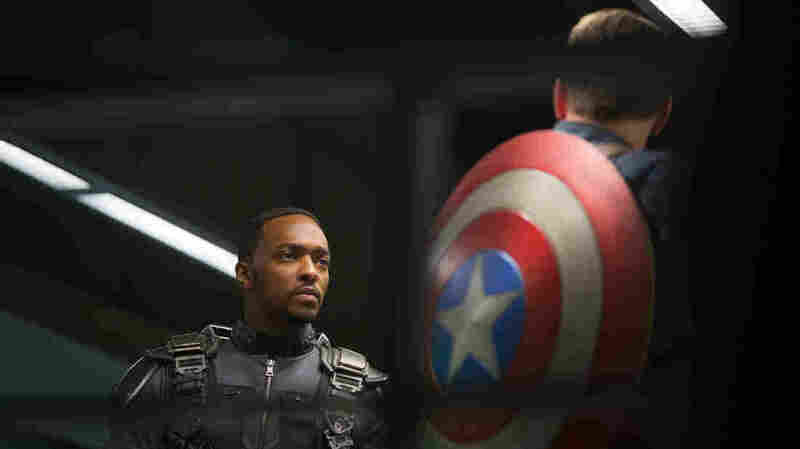 Anthony Mackie spoke with Tell Me More about his latest role, and how he carved an unorthodox path through the movie business. I found out a lot about the Falcon once I got cast in the role. The interesting thing about the character is he kind of is the embodiment of what African-American culture is in this country throughout the course of his comic book life. He was first introduced in 1969, and he was a hustler in Harlem. You know and if you look at African-American culture at that time, you know, we were coming out of the war, we had a lot of stuff going on with us where we were trying to figure out how to move on as a people from desegregation and things like that. And if you look at his second incarnation, late 70s, they moved him to LA. And he was a pimp drug dealer. And that was in the midst of the black exploitation period. So basically, they took what we considered to be a strong black figure and made this, you know, comic book hero, this action hero, him. I wanted spandex from head to toe. All spandex everything! I mean I worked out for six months before this movie, so I made very clear to them that if I'ma [sic] get six months in the gym, I want everybody to know I was in the gym. It's monumental for me because when I started in this business, I said I wanted to be a superhero and I wanted to do a western, preferably with Clint Eastwood. When Morgan Freeman took my role in Unforgiven, I was like, 'You know, that leaves me with the superhero.' So I kind of chased it and went after it. And you know, my career started with an independent movie called Brother to Brother, that we made for like $150,000 in Harlem with just a group of actors and a great director. And from that, I went to a movie that nobody thought would succeed called 8 Mile. And from that, I did small roles in larger films. And you know, even my two most successful movies, you know, Hurt Locker and Half Nelson, were independent movies. So I've kind of forged my way through this business unorthodoxly. Very early on in my career, I was up for a role that was the lead of a very important movie. If I would've got it, I think it would've stalled my career, and I wouldn't be where I am today. I'm glad that I've had the 30 some odd movies that I've had to do to get to this point. And I'm glad my representation gave me the opportunity to take that 12 years and do those 30 some odd movies, so when I got this opportunity, I was ready for it. ...My representatives went after this role for five years before I got it. I mean, we literally emailed Marvel every six months for five years. ... Because I wanted to be in a Marvel movie. And we knew that the rate in which my career was going, that sooner or later, they would be making a movie that I would be right for. So it's better to send a shot across the bow to let them know we mean business, than to wait and be retroactive, and let them find us, we're going to let them know we're here. And I think that's kind of what Steve Rogers [Captain America] deals with in this movie: taking initiative with your ploy on how to control your life. This movie picks up where The Avengers left off. Cap leaves New York, comes to D.C., and basically tries to figure out how he fits into modern society. He meets Nick Fury through S.H.I.E.L.D., and he starts to work with S.H.I.E.L.D. at the top of the film. And then he meets me, and we become friends through the solidarity of soldier kindredship. He's just come back from war, I've come back from war. He lost a kindred spirit in war, I lost a kindred spirit in war. And we bond through the idea of 'what now is our reality,' which I've seen from a lot of soldiers who've come back from war, and I've fortunately had the opportunity of talking to a lot of them since I know so many since Hurt Locker and things like that. But the movie really deals with the ideas: how do you keep society safe when the bad guys have more liberties? It raises questions about the whole government reading emails. It raises questions about, you know, how much about your personal life should the government be able to look into. It raises the whole big brother question. What is social freedom? What is individual access? I'm definitely a nice guy. I'm a pushover. But I would love to be a bad guy. There's nothing more fun. ... I would sleep well every night knowing that I'm a bad guy.